"But Lee? 2013 isn't over yet? How can you be doing a 'Year in Review' post in August?" Is that pitiful or what? That's what I thought, too. Reflecting back my problems started somewhere about September, 2011, not long after I finished the beautiful ride of Cycle Oregon 2011. When I came home from that ride I weighed about 260 lbs. and felt pretty good. Over the next couple of months I was hit by the usual cold/flus/bugs that my kids dutifully bring home from school, which really knocked me down. I mentioned it in my 2011 and 2012 year reviews as well: I considered them bad years but I was getting progressively worse each year, not better. I noticed my sleep was terrible: I would routinely wake up in the morning more tired that when I went to bed. Sleeping in until 8 or even 9 am become routine, which left very little time for exercise, let alone bike commuting. The last straw was my weight, breaking 300 lbs right at the beginning of the year. The first thing I did was schedule some time with my family doctor. I gave him my sob story and he ordered up a round of tests, which I was pretty sure I knew the results before I would see them (negative for diabetes, high cholesterol, and high blood pressure). What I didn't expect was the diagnosis of hypothyroid and possible sleep apnea. The Doc started me off on thyroid replacement hormone (with follow-up appointments to check hormone levels) and a referral for a sleep study. Before I could get in for the sleep study, though, I had yet another set back. I woke up one morning fully prepared to ride into work. I was all dressed for it, bag packed, and ready to go but my body was telling me to stop: something just wasn't right but I couldn't put my finger on it. The next day I woke up with significant pain in some rather tender areas. Since I had had no recent trauma or injuries I went in to see The Doc again. After explaining my symptoms, The Doc calmly said, "Sounds like you have a hernia." After failing the "turn your head and cough" test (every man will know what I'm talking about) the diagnosis was official (Follow that link only if you want the gory details of exactly what went wrong. You have been warned!). Prognosis: full recovery after required surgery. Recovery time of 4-6 weeks. The words of Bill Cosby were sooooo true, "They didn't tell me they were sewing my knee to my chest!" For almost a month I couldn't walk very fast, stand up fast, or ride my bike. Oh yeah, and I still wasn't sleeping well. I was in sad, sad shape. My surgery was on May 17th, a Friday. The surgeon was Dr. Eiji Minami, an amazing surgical specialist at Overlake Medical Center, although my surgery was at Evergreen Surgical Center. Dr. Minami was one cool customer: The time from when they put me under to when I woke up in the recover room? Just under 60 minutes. The best part: no sutures/stitches! I am absolutely in love with surgical adhesives (i.e. they glued the incision closed). Wired up and ready to sleepAll those sensors made it very difficult to sleep. I have to say it was the worst night's sleep I have ever had. Diagnosis: moderate sleep apnea (not severe but not mild either). Prognosis: much better sleep with a CPAP machine, which I brought home on Aug. 5th. My first night was 2 nights ago and I have to say it did make a difference in how I felt in the morning. I have high hopes for the future. How about my rides since my surgery? My first post-surgery bike commute was on June 28th and, wouldn't you know it, the road department went and made all the hills around here longer and steeper! I was really dreading that first commute. In the morning I was joined by my son Patrick for the commute in to work. 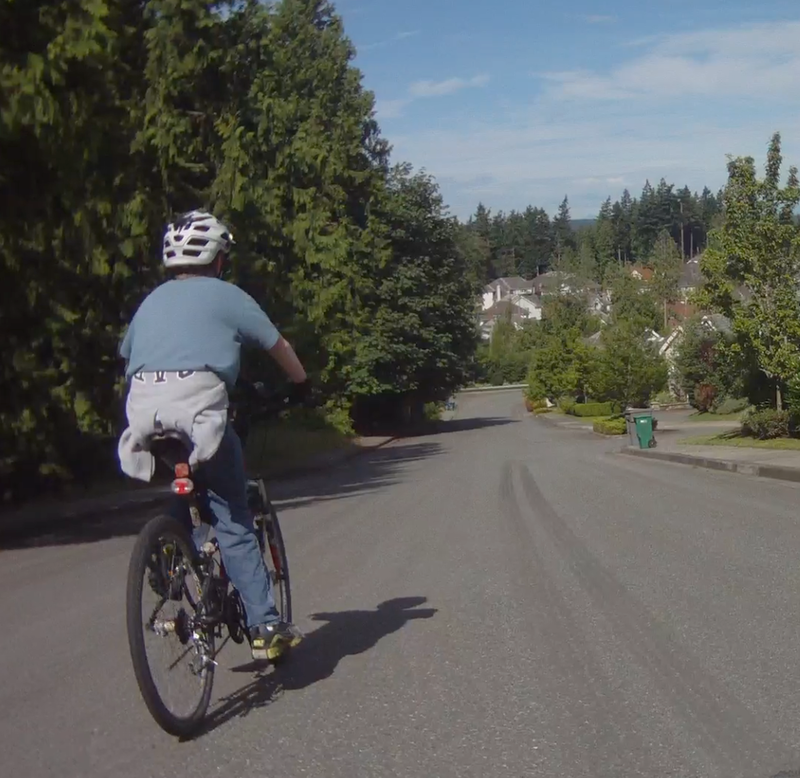 He really likes to ride, even if it involves climbing a big hill to get to my office. Patrick riding with me to work Patrick riding down "the hill", i.e. NE 42nd WayI was really dreading the first ride up Sahalee Way, even if it is the easier of the 3 options for coming home (lowest grade at 10% but 1 mile long). Fortunately I ran into a friend, Gustavo, who I have raced with twice and ridden numerous times. He offered to follow me home to make sure I actually arrived. That was music to my ears! Gustavo and Varugis waiting for me at the top of Sahalee WayAnother friend from work, Varugis, a very dedicated bike commuter and fast hill climber, just happened to meet up with us. 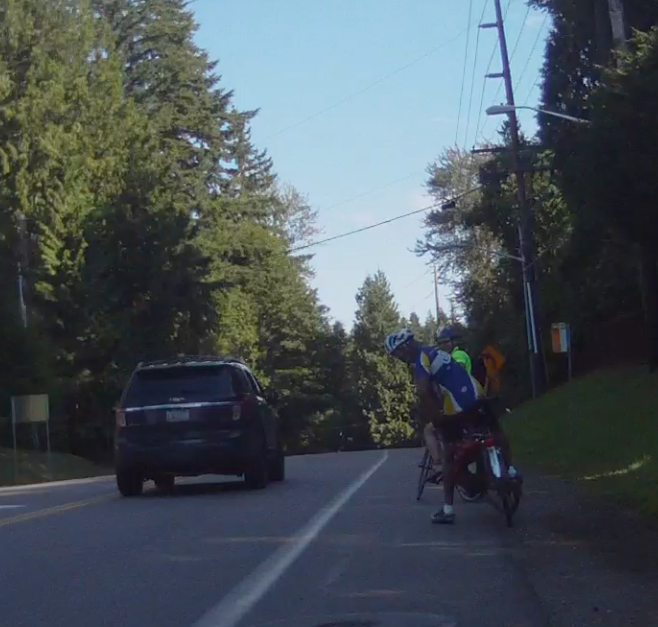 He took the "brutal" NE 42nd Way climb up the plateau and passed right in front of Gustavo. Thankfully we barely paused to say hello, otherwise I might have fallen over from shear exhaustion. They stayed with me until I passed their subdivision (they live in the same neighborhood). Gustavo and Varugis splitting off to head homeI was sooooo thankful they were able to ride with me. There is something about shared-suffering that makes it a lot easier to bear. Ride more miles in 2013.2 than I did in all of 2012. Do at least 1 Sprint Triathon. Ride to the Company Meeting. Do at least 1 "jog home" commute, where I jog the 8 miles home from my office. CPAP machines are awesome! Not terribly comfortable but mine does help me sleep. My motivation is clearly tied to the quality of my sleep. Go to The Doc earlier next time, without waiting 18 months and gaining 40 lbs. Now to get started on jogging. This should be easy, right? Posted in Commentary, Training and tagged with bike commuting, cycling, medical issues, year in review. August 6, 2013 by Lee Donnahoo.